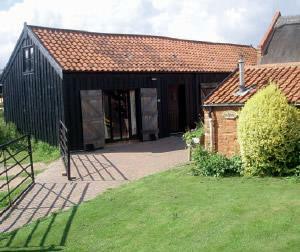 Award winning barn conversion in quiet village near to North Norfolk coast, the Broads and the city of Norwich. Comfortable, cosy and well equipped. Sleeps four. Private garden and BBQ. Good disabled access with walk-in shower and level floors. Open all year. If coming from the A140 South, the A11 or the A47, travel clockwise round ring road in Norwich (not the bypass), look out for a McDonalds and then a B&Q store on your left. At next set of traffic lights, follow signs to Cromer on A140. Continue out of Norwich (airport on right) for 12 miles and take Cromer sign at roundabout at Aylsham. Continue for 1 mile then turn right (to Burgh) opposite Aylsham Bath and Door Centre. Continue for 4 miles. Pass Skeyton Church on left. We are one half mile past the next crossroads on left hand side past the Swanton Abbott village sign/30 MPH sign. Turn down track and barn is straight ahead.